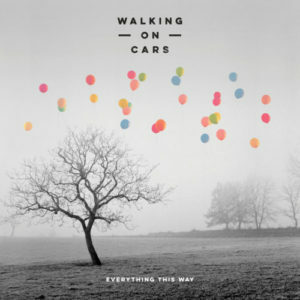 Irish band Walking On Cars will kick off a U.S. tour on May 18th at the Music Hall of Williamsburg in Brooklyn. The headline run will also include a show in Boston, Philadelphia, Chicago, San Francisco and Los Angeles. Tickets are available at http://www.walkingoncars.com/. See below for itinerary. “Speeding Cars,” has over 3 million hits on Youtube. Produced by the MyRiot production team of Tim Bran and Roy Kerr (London Grammar, Bloc Party, Foxes), Everything This Way was the only pre-order able to take the No. 1 spot away from Adele anywhere in the world when it claimed the top spot in Ireland. In the U.K. the album topped iTunes Alternative Albums chart. Walking On Cars is Patrick Sheehy (vocals); Sorcha Durham (keyboards); Dan Devane (guitars); Paul Flannery (bass) and Evan Hadnett (drums) hail from the remote coastal town of Dingle. During a particularly bleak winter, the five friends rented a farmhouse outside of town so they could focus on writing music without the distractions of daily life. Six months later, they emerged with lyrics that veer between tenderness and anguish, soundscapes that sit back, intricate and restrained, and then explode into color and vocals that roar of heartache and romantic longing. After spending two years on the road, Walking On Cars became Ireland’s biggest independent band, playing sold-out shows, including two nights at the Olympia in Dublin. They won over more fans during their supporting slot on The Kooks’ U.K. tour and at such festivals as Reading & Leeds, Bestival and T in the Park. The band, which has also supported James Bay, Kodaline and The Script, recently played a sold-out show at KOKO in London. Previous PostJob Well Done to Na Fianna Band!